sponsered by LFA and MALA! 8 Lipizzans participated with Judge Mr Christmann. Siglavy ll Hope (Marti) is 27 years old. Marti is a mature gentleman who illustrates the longgevity of the Lipizzan breed. Devon announced his age over the loud speaker. The crowd showed their appreciation for this remarkable horse. We were honored to have Siglavy ll Hope in the Lipizzan class. Marti also received MALA's Ambassador Award for 2004. An interesting show experience and a gallant show of patience and character for our MALA Members and Lipizzans! 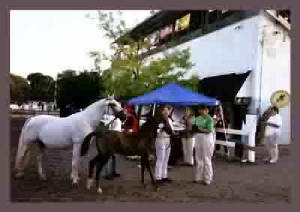 This year Fair Hill had 6 Lipizzans entered. Only 5 ended up showing. Fair Hill had to stop the show for 3 hours due to both ambulances leaving the show grounds with injured people. They stopped the show right as the first Lipizzan entered the class. Three hours later all of the Handlers had left. the Breed Judges had left. 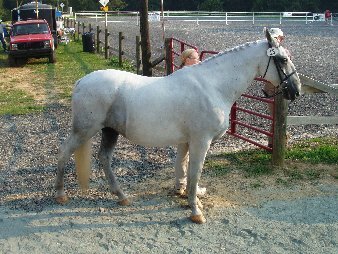 The Lipizzan Class was judged by an under saddle dressage judge. It was a 90 + degree day and humid. All of the Lipizzan owners handled their own horses for the class. 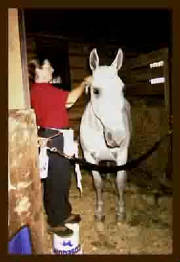 When the show was over MALA received a letter from the assistant show organizer complementing how patient the Lipizzan horses and their owners were during the long, long delay. Well, I guess it was nothing compared to what the Lipizzans have endured all through history.